62285 2 pc Quick Change Bit Holder Set 1/4" Hex Description: Quick change 1/4" shank with built-in magnet to hold bits secure while in use. 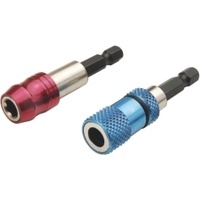 Accepts all standard 1/4" hexagon driver bits. Specification: 2pcs 1/4" hexagon driver bit.